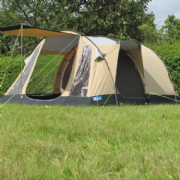 Listed below are a range of Clearance Camping Tents we have stocked over the last 2 years. Some are End of Line stock, Second hand tents, Factory seconds where something was not quite perfect with the tent, and Floor display models. You will be guaranteed to pick up a bargain but please note that these are one-offs and once sold we have no more. You will have 2 weeks to check our your tent purchase and if you are unhappy at all we will take it back and give you a full refund no questions asked. Each tent has been erected in store during the winter and fully checked by our staff. Each tent will have a note as to what has happened, so that you know what you are buying. Any Second Hand or Display Model tent purchased MUST be collected in store, as they are out of their packaging. Replacement Canvas For Dresden Trailer Tent only.